I’ve had this for 2 years now and am still making ugly curtains with it! i bought this machine about 10 months ago, and i have worked that machine about as hard as you could work it. i quilt, and i've made several quilts since i got this machine. overall, i really love it. it's small, it's lightweight, it's portable. it's easy to use. BUT... i realized i was having some tension problems, like other people have mentioned, so i decided to take it in to get a tune up. the place i took it to gave a free estimate, and they said the timing was off. they wanted to charge me almost what i paid for this machine to fix it, and that didn't sit well with me. when i told that to the guy at the repair shop, he said that the problem was that this machine has plastic gears. you mix plastic gears with heavy materials (quilting), then you're going to have problems. thankfully, i got the 2 year replacement plan, so i'm getting a full refund, and i just ordered another machine. the thing is, even with that pretty big issue, i have used it for 10 months with no problems until now. so i ordered the next one up - the CE5500. we'll see how that one does. i've never had a fancy machine, so i really don't know how this compares. all i know is that at this point i'm not prepared to pay the big bucks for a fancy machine. 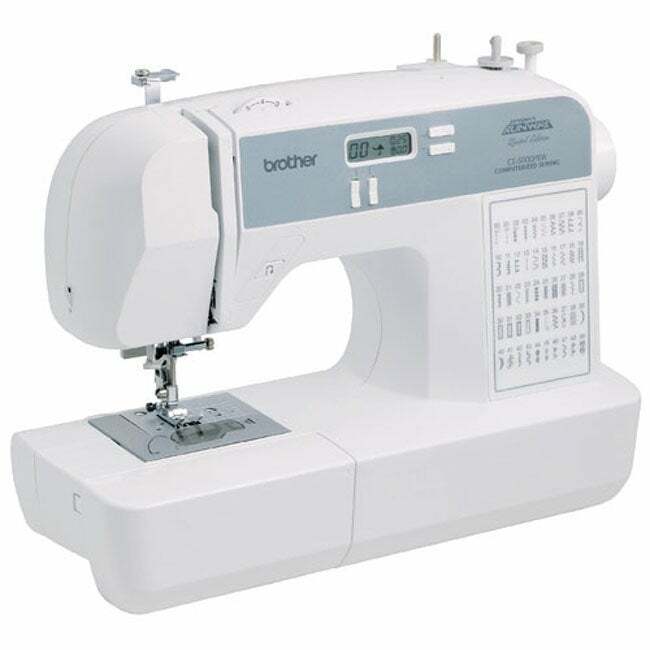 I didn't use this machine when I first purchased it, so I couldn't return it, and when I finally used it, it could not sew anything slightly heavy duty at all. It is fine for just minimal sewing. Last time I used it the thread pooled under the fabric, the needles kept breaking and it was just a pain to sew on because I make crafts that are different thicknesses. I finally bought another machine that sews all fabrics and thicknesses and it is sooo much nicer! Since this was refurbished when I purchase it, I can't see how repairing it again would help. I would be embarrassed to sell it to anyone for fear it would do the same thing as it did to me, and obviously the person before me. This is the best sewing machine I’ve ever used. It’s so easy and has a lot of great features like the numerous stitching patterns available. So easy to thread the bobbin and from it right in yo start sewing. I taught my daughter on this machine and it’s beem nothing short of exceptional. This machine is good for basic sewing. It has a lot of stitches to choose from as well as an adjustment for stitch width. Occasionally the pedal would take off by itself and I believe this was due to being refurbished. I still have it and it works as good as ever. Bought this machine after watching Project Runway. The machine has lots of stitches available at the push of a button. The machine is very easy to use. I did have a problem when trying to sew heavy denim with the machine. Super sewing machine for a refurbuished product. Has a ton of computerized options to choose from. Great machine to learn to sew on. Excellent for all types of sewing projects. Bought these 2 for Church quilting group. Price is great; machines in like new condition. Ladies like them. This model has a quilting setting and foot. I love this electronic machine! It is lightweight, and as an experienced seamstress, it does all that I need it to do. I like the selection of stitches, which are easily programmed by pressing the buttons. I use this machine a lot and it runs well. For under $$$, it was a very good buy. This was such a good machine to purchase. I unfortunately don’t have the talent for sewing but if you do know how to sew then all the extras it comes with are Amazing! I've had this sewing machine for years now and it's always worked very well, I certainly can't complain. I made my wedding dress with this and many other projects. I love it. Love this machine! I have a lot of machines and experience and this one is great for a beginner and more advanced sewist. SO easy to use and had oodles of features. You won't be disappointed. I got the sewing bug when I had my son. I was home for 3 months and couldn’t wait to make some curtains with this beautiful fabric I bought. Machine was super easy to use. I don't use this a whole lot but it has always performed well when I have a chance to pull it out of the closet and sew something. I've been impressed with its ability to handle multiple types of chores for the price I paid for this. I would say it's quality is limited only by my skill (or lack thereof). To be honest this sewing machine did not last very long. I had it for only a year before I had to upgrade. I upgraded to a *** and have been much happier with that purchase. "having trouble with my project runway limited edition brother the thing on the side that rest the needle has got really tight please help me"
Thank you for your inquiry; you will be contacted by Customer Care. "Does this product come in it's original box?" Since we buy in bulk and alot of times straight from the manufacturer we cannot guarantee packaging. "Does this machine come with a case or cover?" This item does not come with a carrying case. "I have this sewing machine, but i can't find my book to it. Is there any way that i could get a book?" We''re sorry, but we do not have any spare manuals. Please contact the manufacturer either by email or phone to order a new manual. "What other presser feet does it come with?" This product comes with quick-change presser feet and accessories for zipper insertion, darning, twin-needle stitching, and button sewing. "I am having trouble with the tension on my machine. Is there a way to adjust the tension?" The tension is automatic and controlled by a computer chip in the machine. When thread bunches up on the bottom of the material, it means that the there is a problem with the way the machine is threaded. First lift the presser bar. Then turn the tension dial to zero and then to four. Then thread the machine with the presser foot in the up position. When you get to the part where you thread the needle, lower the presser bar. When you thread the machine, remember to have the presser foot in the up position so that the thread can catch in the tension dial on the inside of the machine. When the presser bar is in the up position it opens the disks. The thread needs to go in between the two disks for the tension to work.